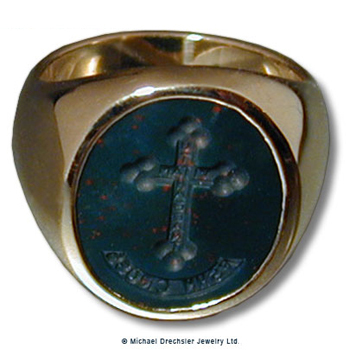 Classic style signet ring in 14 Karat yellow gold signet features a 14 x 16 millimeter, oval bloodstone carved with crest for the RSHM. This bloodstone has been carved deeply in reverse for wax sealing. It has the Latin words on the cross. "Ut vitam habeant" and RSHM CROSS. The Latin means that "they may have life" It comes from the New Testament -- John's Gospel. It is part of the charism (spirit) of the Religious of the Sacred Heart of Mary. In all the order does that is what they hope to bring to others. They do a variety of ministries. The ring arrived and it is absolutely perfect! Words do not describe the craftsmanship and distinction it shows. It really is beyond words! Medieval Christians often used bloodstone to carve scenes of the crucifixion and martyrs, for which reason it was also dubbed the martyr's stone. According to the legend about the origin of bloodstone, it was first formed when drops of Christ's blood fell and stained some jasper at the foot of the cross. A beautiful example of carved bloodstone with the seal of the German Emperor Rudolf II can be seen at the Louvre in Paris.